Welcome to the Row by Row learning center. 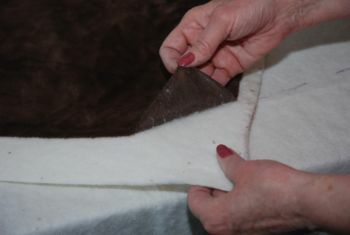 All of the quilts on our site are made using this simple procedure. It isn't new, we just re-used a great idea and added some glue. Just follow the directions and you will be able to make the greatest quilt ever. Never in my wildest dreams did I ever think I would be glueing quilts together. 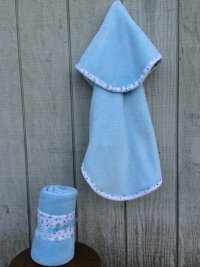 I have always loved to sew and have made some pretty georgous quilts, but this method has broadened my horizons. Give it a try, you won't be dissapointed. 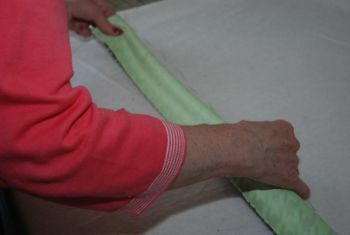 Cuddle fabrics, often called Minkee have a reputation of being slick, stretchty and hard to sew. While this is true, if you use a few tricks I have figured out, you can make a beautiful Cuddle quilt and have fun doing it. The first thing you need to do is to fuse the back fabric and the batting together. I like to use the Warm Bond batting from The Warm Company. 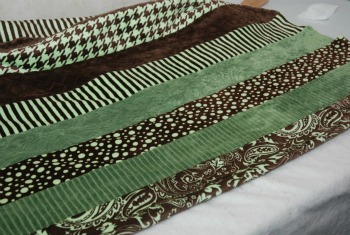 It is an 80/20 blend of cotton and polyester and makes the quilt very soft and cuddly. It is also very washable. Lay the batting on a large table or the floor. I like to tape the batting to the table so it stays flat and in place. Cover the batting with the backing fabrics, placing it right size up exatly where you want it, matching up the edges so they are all even. I like to have the batting just a little larger than the backing fabrics so I can trim it all up even after it is glued down. Start with the top edges and fold the backing fabric back over it's self about half way back. Starting near the fold; spray the backing fabric about half way up. Be sure that you get the edges as well. 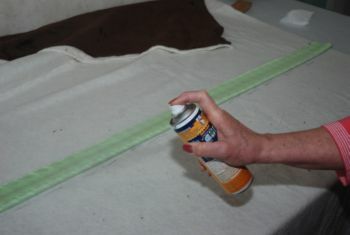 Spraying on the fabric instead of the batting gives you a better grip with the glue. ( When you spray the batting the glue dispersed into it). Fold the backing up onto the batting, smoothing it down just as you would if you were sticking down contact paper. Be careful not to stretch it or create any wrinkles. If it isn't straight just pull it off and re-stick it. Repeat the same step for the rest of the backing. I like to use a big strip of freezer paper to protect the rest of the fabrics while I spray. I love this spray adhesive, but it does have a big overspray. Be sure to protect the surfaces around you. I have found that Goop cleans it off really well. After you have finished, turn the backing over and make sure the batting isn't wrinkled. If it is, just pull of that section and re-fuse it. Now that you have finished spray-fusing the backing and batting, trim the excess batting off. 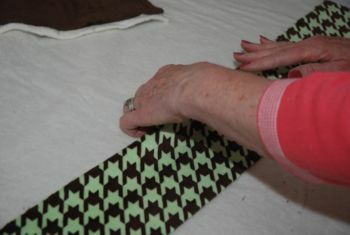 You want to be able to place your strips right on the edges to make sure everything comes out evenly. The next step is to find the center of the quilt. For the Adult Row by Row you want to mark a horizontal line across the 60" width. 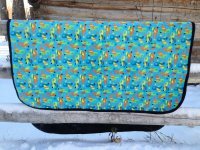 For the baby row by row you want to make it vertical with the 60" length. 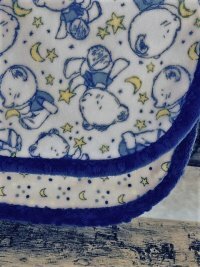 When making the other baby quilts with the borders, you need to make center horizontal and vertical lines plus lines to show you a start and stop line for the center sections as shown on your patterns. To find the horizontal center just fold the back/batting piece in half top to bottom and make a line along the folded edge. To make the verticle line justs fold the back/batting piece inhalf side to side. A fine tip permanent marker works really well. Getting this line placed right in the center is important as you want your strips to come out even on the ends. All of our Row by Row patterns start by placing the strips in the center. Fold the center strip in half with the fold right along the horizontal mark . It is important that this starting line is pretty straight or your rows slant. 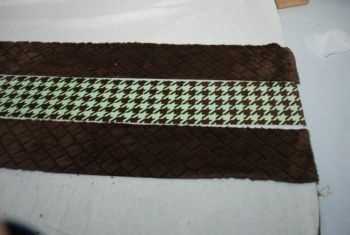 Be sure that the ends of the strips are square with the edges of the backing. As you sew each strip on be sure to start right up to the edge. Your strip will probably be a little long so don't short yourself on the starting end. Spray-fuse the strip down by spraying the first half of the strip. It doesn't take a lot of spray, you will be able to tell, just make sure that the ends are secure. Unfold the strip and secure down the first half. After you have hand pressed out all of the wrinkles and your strip is secure fold back the other side. Spray-fuse down the second half of the strip and then secure the strip down. Now you are ready to start adding the strips! The quilt is based on everything repeating from the center. Each trip to the sewingmaching you will sew on one strip set. Sew up one side and then down the other. Try laying your strips in order on a work space near the sewing machine. It will save you alot of time as you are building the quilt. I like the nap to go out from the center. I have tried making the nap all go down on a quilt and it just didn't seem right. It's like petting a kitten and going backwards. I always go to the outside. if you are going to sew on borders, you will want the nap on them to go to the outside as well. Check the nap of each strip before you start. I like to use a 3/8" to a 1/2" seam allowance. It is much easier to control if it is wider. 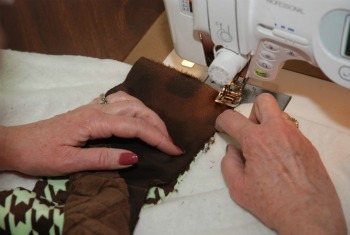 I also use a walking foot to help the thick fabrics feed easier. If you can adjust the pressure I like to reduce it to just under 1. I "gently guide" the fabric through. I don't like to push or pull hard, but you do need to ease it through. It is pretty thick so it feeds better with a little help. Using a #90 Schmetz stretch needle helps as well. Your first trip to the sewing machine is pretty bulky. Try rolling the ends of the quilt in a roll so you can hang on a little better. As you add more rows it get much easier to handle. 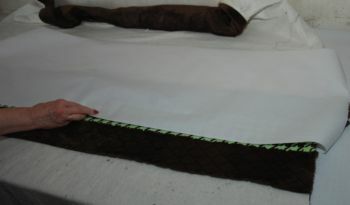 After you have sewn on the first two strips, one on each side of the center strip, it is time to spray-fuse them down. I like to use freezer paper to protect the rest of the quilt from the overspray of the glue. Just place it over the center of he quilt and then fold the last sewn strip up over the paper. Spray the back of the strip and then secure it down to the batting. 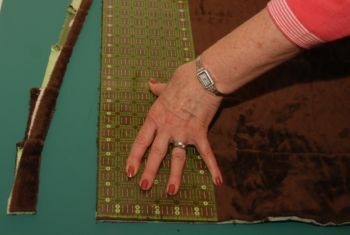 Carefully hand press down the strip by using a firm petting motion. You do need to pull on the batting enough to make sure that it doesn't wrinkle or pucker, be sure that the backing is flat. 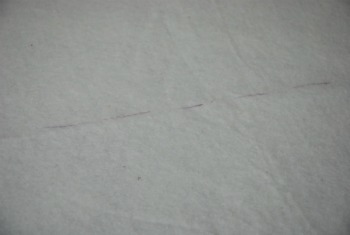 If you pull the strip to hard as you pat it down it sometimes rolls the seam over so it creates a bump on the back. 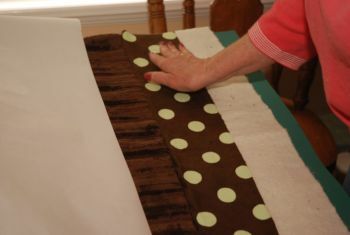 Just be sure that each strip is spray-fused down flat and evenly before you sew on the next strip. 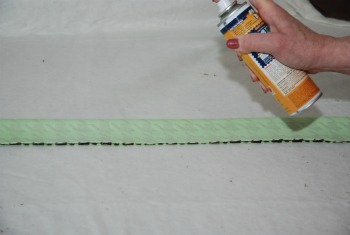 Check the ends of the strips to be sure they are adheared evenly and are square with the edges. This is espically true on strips with a line or texture. 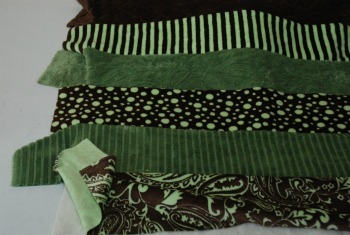 Continue to sew on each strip set in the order you like. Be sure that you are always checking to make sure that the nap is going out. I have pulled off a few strips to re-do, and it can be done, but it's not very fun. You can see that the combination of different colors and textures really adds to the beauty of the quilt. You can see that the ends of the strips don't always come out even. Some of the textures stretch more than others. I do try to keep the batting pulled evenly as I sew, but some just stretch more or are actually wider than others. It is okay, if they aren't exact. In the end you are going to trim them all off. They are glued down, and unlike cottons they still lay flat. Be careful not to stretch them, but don't panic when they aren't even. After sewing on the last strip set spray fuse them down securely. It is important to make sure that the ends and edges are secure. It makes sewing on the binding a lot easier. You will have some on each end to trim off. I always allow a little extra length because everyone's seam alowances is different. I would rather cut off a few inches than have to sew on a few. (I have done that to! ) 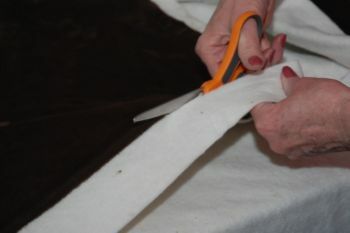 You can actually use the end strip you cut off for binding if it is 2". Using your rotary cutter and ruler trim off the outside edges. When triming the sides I turn the quilt over and use the selvedge as a guide line. I usually cut off about 1/2" under the selvadge lines. I don't want to see the selvedge marks in my quilt. Contunue to square up your quilt all the way around. When trimming the quilt you are going through a lot of layers. This is kinda hard on your mat, so I have tried turning my mat over and used the back side. It saves the front of the mat. I have also found that using Goop will also clean up any overspray I have had on the mat or other things I didn't move. Congratulations, you are just about finished with your quilt. This wasn't so bad was it? 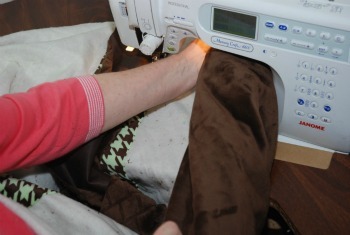 Now, for some tips on how to bind your quilt go to our "How to bind a quilt" section. I hope you had great success and are ready to do another one. If you have any questions be sure to send us an e-mail. I will try to get right back with you.